With closing of Berlin airport Tempelhof ended the period in airline industry of the Germany. It was a period of the Second World War, the era of the Cold War and the „rebirth“ of the German capital at the beginning of the nineties in the late 20th century. Tempelhof airport was built in the area that belonged to the Knights Templar during the Middle Ages, and is therefore named after them. The Knights Templar was the order that developed during the Crusades, but over time financially strengthened and spread its operations all over the world by buying land, among other places – the land in medieval Berlin. Airport complex was built in 1923, and famous German airline Luft Hansa was established at the airport Tempelhof only 3 years after completion of construction work. After symbolic landing of DC-3 and Junkers Ju-52 from the thirties, lights on the runway were put out forever. Tempelhof was officially opened in October 1923, and the existing airport complex got its shape under the Nazi rule. Adolf Hitler decided to make the site „air stadium“ with the use of large stone blocks and pillars. He was helped by Nazi architect Albert Speer, who constructed new terminal envisioned as a sign of a new and more beautiful Berlin, which was supposed to represent the “capital” of the world. The complex consists of 49 buildings, seven hangars and about 9,000 offices. And the truth is that before the Second World War Tempelhof was one of the busiest airports in the world. According to the available information, there were about 50 international and 40 domestic arrivals per day. During World War II, German planes took off in attempts to protect the capital from Allied bombing. But it was closed to civilian flights, because then government feared that the Allies intended to bomb the airport. In general, airplanes took off only in emergency cases. Soviet forces captured Tempelhof in the battle for Berlin, and it is interesting that the officer in charge of the airport refused to tear it down during retreat, but rather chose to get killed at the site. Delegates of the Allies had just landed at this airport when Berlin was conquered and Germany signed the official capitulation. 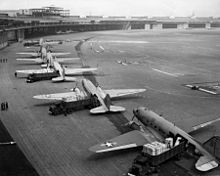 After the war, Tempelhof became an important American military base. It became a symbol of the great operation in 1948, when basic supplies were delivered to Berlin by air, during the Soviet blockade of roads and waterways to the city, with the aim of the eviction of the Allied Powers from the German capital. Only after these events, the American Overseas Airlines established air communication between Berlin, Hamburg and Dusseldorf in 1950. By 1960 PanAmerica was the first company to fully provide all kinds of passenger services for travelers on their way to or from West Berlin. In the mid seventies, with serious investment in air traffic, the volume of passengers reached over 5 million annually. Following the German reunification air traffic at this airport weakened, so in 1996 a document entitled “Consensus resolution” completely redirected the traffic from Tempelhof to the Berlin-Schönefeld airport. In mid-2008 even a referendum was held, the citizens pleaded against the closure of the airport. But despite such initiatives, airport was closed. Today, Tempelhof airport is transformed into a park. Its future and long-term purpose is still in planning, but the way it is now is interesting to tourists and residents of Berlin, especially wind-skating enthusiasts who have two runways, each 2.5 km long, at disposal for their stunts.